The RPGPundit, in his own matchless manner as “the new and improved defender of RPGs” has taken on the utility of say yes or roll the dice. It’s something that has mostly gone unquestioned, even on (he would of course say especially on) the Forge. I used to hang out on the Forge a lot when it existed, and had many great conversations there. Gods & Monsters uses a lot of of what I learned there, which is mainly that rules must mean something; if a rule doesn’t mean anything, get rid of that rule. You might think that this rule goes without saying, but having cut my teeth on AD&D in the hybrid form that consisted of some AD&D books, some Blue books, and some BX books, rules that didn’t mean anything or were never used are a basic part of my education. Go through the amazingly cool AD&D Dungeon Masters Guide, and most of those rules were not used by the writers, let alone by the customers. From the Forge, I learned about hooks, but used them solely to help the game master end arguments about whether or not your character will do that. You said your character will do that, it’s right there on your character sheet. It is meant to divert play away from pointless, fun-sucking tedium. It was there that I also learned about building your character in play, but the sole reason for building your character in play is to avoid skills that wouldn’t make sense in the pre-existing world. But while “say yes or roll the dice” sounded very cool the first time I read it, you will not find it in the Gods & Monsters rulebook or in the Adventure Guide’s Handbook. The reason is that while it does sound cool at first glance, it has no practical use in the kind of games I enjoy playing in and running. I enjoy games in which there is a world that can be interacted with, and through that interaction discovered. Now, this is not to say that random chance will not fill my games when players ask questions about the world. In many parts of the world, I don’t know nor care whether woodcarvers cater to magicians on the side. For those places, if the player character magician goes looking for carved arrows, I will assign a chance of one existing in this market, and roll it. Saying no is also behind the very useful tool of abduction—which I learned about on the Forge—where the players think of clues that will be there if their guesses about the mystery are correct, and the GM looks at their guesses and why they are making their guesses, and says, why yes, you are right, or goodness no, where did you get that idea? A real world that already exists is critical to abduction. Abduction simply doesn’t work if you only say yes or roll the dice. It requires saying no if their abduction is wrong. The Heisenberg’s Cat gaming style should also be understood with this in mind; it isn’t that the world didn’t exist before the player characters decided to head that way, but that the game master didn’t waste time creating details that wouldn’t be used, or (especially) creating “plot” that doesn’t involve the characters. The critical question—which RPGPundit asks in the comments—is whether the new thing exists because it always existed, regardless of where the question came from, or does it exist solely because the players asked about it and if the question had come from other than the players, would it specifically not exist? Gary Gygax used to argue that you need to be fair to your non-player characters. And it’s very important, because your players explore the world through the NPCs as much as through their own PCs. You can’t say, “yes, you guys can fly the eagles to Mordor and drop the ring in the volcano” if you would have said “no, Gandalf can’t fly the eagles to Mordor and drop the ring in the volcano”.5 In many cases, you already have said no (to the NPCs) so that saying yes now doesn’t make sense. It’s just that you didn’t think about it, because you knew intuitively that the eagle option wasn’t going to work. Say yes or roll the dice bypasses your intuitive knowledge, which is probably more than 99% of your knowledge of your campaign world. Even the fastest-typing GM in the world couldn’t write down more than 1% of what they know about the world they’re running. Even self-contained dungeon worlds are too big for that. There has always been a conflict in gaming between the character’s character sheet and the character’s player. If a character of intelligence higher than the player cannot use it, should players of low-intelligence characters ignore that number, too? Similarly with charisma and wisdom. If you’re not going to allow players to take advantage of high stats in those areas, you might as well get rid of them. But if you do allow them, and allow the player to make rolls to know or do things, you are allowing the player to cede control to the character, to do things that the player has not spoken specifically of. An ability that says, yes, I remembered to bring rope even though it isn’t on my character sheet isn’t any different than a stat that says, yes, my character knows the constellations even though I personally don’t. The existence of “practically impossible” on the difficulty level chart is part of that mindset. As long as it’s something the character is trying to do with the character’s abilities, then saying, sure, go ahead, but it’s practically impossible is a good idea. You’re not forbidding the character from jumping across the huge chasm. And if it’s something the character is good at either from their class or their speciality, and they have lots of mojo left, they might be able to succeed. But you will note that there is no “Impossible; penalty 32” on the chart. Sometimes you just have to say, no, without any caveat, if you’re going to be fair to the player characters, who are, after all, discovering a world that has rules. I also enjoy Dogs in the Vineyard, which is where say yes or roll the dice came from. Depending on their character knowledge, I may or may not roll some percentile dice anyway; but the answer will not come from the dice. This may seem obvious, but it isn’t. 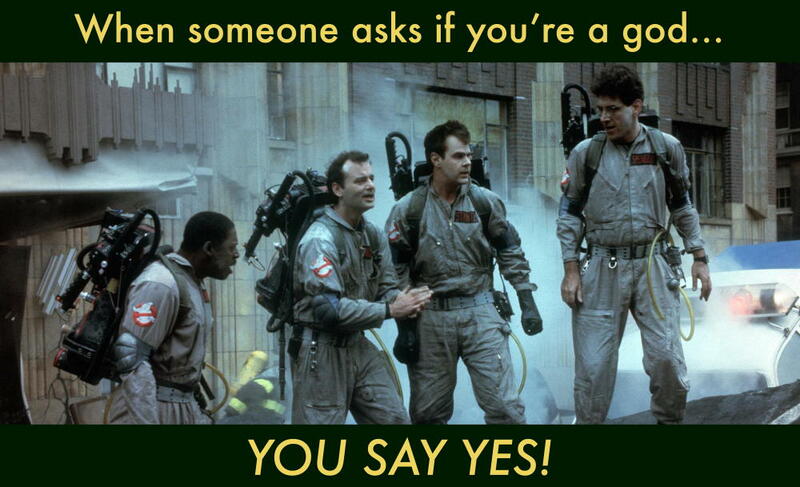 Many GMs don’t realize that they can say no, and I’m sure there are also GMs who don’t realize that they can say yes. The “maybe” option is why I design my wandering monster charts the way I do, with percentages of classes of monsters. I can use that to remind myself of actual chances that can be rolled. For all the complaints about GMPCs, being fair to your NPCs is one of the hardest parts of being a game master, in my opinion, because the NPCs aren’t your friends. It is just as wrong for the players to try to force a story as it is for you to try to force a story. The railroad is a railroad no matter who is at the engine. Foresight requires that having the antidote not conflict with anything that has gone before, and Provisioning would require both that and additionally at least an hour to find the antidote. But the basic idea, that the character can think of things that the player didn’t, is there. And in fact, in the comments he does add the caveat, “in anything other than their own PC and its actions”. Solving mysteries in role-playing games requires that the players take part and do more than just look, they need to theorize. And the game master needs to be flexible about clues. Say yes or use the magic 8-ball last modified December 28th, 2015.